← Another solo woman full-timer! I step out of the BLT and notice Lee is gone. As Lee was leaving our campsite, she said she needed to go to the laundromat. I guess she decided to change locations, too. Although I would’ve liked to get to know her better, I’m glad she’s doing what she wants to do and going where she wants to go. That’s what being a full-time vagabond is all about! The crew and I find more metal sculptures by Ricardo Brecedo. See the PTV in the background? The crew and I take a drive through Yaqui Pass. Why, I don’t know. That road is scary! (I’m guessing Yaqui is Native American for yikes.) It’s the kind of road where I talk to myself out loud, and then when it gets really bad, I break into song. And I never sing. If babies cry when you sing a lullaby, that’s pretty good proof that you shouldn’t be singing. In church I always sit up front in the first pew so I don’t have to see fellow congregants turn around in horror to find out where that awful sound is coming from. Anyway . . . I’m singing like a canary in pain by the time we’re winding through Yaqui Pass. We make it to Tamarisk Campground. There’s not much to it. The sign says you can camp there for $25 a night. No, thank you! I decide to return to Borrego Springs before I lose my nerve. It amazes me that there are overlooks along such a road. I can’t imagine parking on one of the skinny turn-outs at the edge. I keep my eyes on the road, don’t look down, and sing us on out of there. On the way down from the pass, Borrego Valley spreads out below. It’s quite steep so I’ve got the PTV in second gear, going around 40 mph. I glance in the side mirror and see a gigantic Class A with toad barreling toward us! Oh my gosh! Does he not have brakes? I see a place I can pull over to get out of his way, and just in time, too. Whoosh! Further on, I see the same Class A on flat ground, going like a bat out of . . . out of Yaqui Pass. Unless it’s a medical emergency, that driver is a complete fool. I score a bargain at The Frugal Coyote. What? You expect a transition? When in the shop a few days ago, I spy a large throw, something I’ve wanted for a long time. Even when the days are warm in the desert, once the sun is down it’s cold. I enjoy sitting outside, often before sun-up, to drink my first cup of coffee. I hold off buying the throw because I see a sign on the thrift shop door that reads “50% off before 10 a.m.” Today I buy it at 9:35 a.m. for $4, instead of $8. The price makes it extra comfy. The waxing of the Best Little Trailer is coming along nicely. It will probably be a week before I’m finished, as I only do a small section each morning. I have some other maintenance jobs lined up, too. This is the best time of year to get these tasks done. I also want to take the Perfect Tow Vehicle in for an oil change before we leave Anza Borrego. This entry was posted in Simple living and tagged Anza Borrego, art, Borrego Springs, Breceda, Frugal Coyote, full-timing, sculpture, Tamarisk, thrifty, vagabond, Yaqui Pass. Bookmark the permalink. Now I’m worried the sun will hit that shine and it’ll burst into flames! Sorry lee left, I felt a let down. It has got to be hard to boondock without solar though. Love the throw and the price. You have many talents, photographer, bargain hunter, home finder for lost dogs, mountain road driver and blog writer. wow! Thank you, Jean. We all have many talents. Mine show up more because I blog. Someone’s always in a hurry…………………….to do what I always say to myself. Good eyes scoping out the 50% sign….is that your throw or Bridget’s? The BLT is looking quite spiffy! That wax is nice…wipes on and off real easy. Hate the stuff that wipes on nice and gets your arms in a tizzy trying to get it off! It is a good wax. It dries to a “hard” shine. Please send me the article about Timber that was in the AZ Republic c/o General Delivery, Borrego Springs, AZ 92004 (My email is messed up right now.) Thank you! Okay I will get that out tomorrow. Mail goes out at 4pm……I’ll send it in one of those priority hard envelopes. Takes about 2 days. That’s great, although you don’t have to send it priority mail. I’ll be here. I haven’t met Tish yet. I know where her shop is. I did meet Patty briefly today! Quite a character . . . I love those sculptures! One day I will get out there and check them out for myself. Until then, I will enjoy them through your phots. She does add a lot to the photo! Right across the road from Tamarisk is Yaqui Springs FREE open space camping. Birds, pretty little cacti, peace and quiet. Too bad you missed it. Funny, all I remember across the road was a very steep hill. Is there a lot of cholla there? I saw a lot of it on the way up and through the pass. No way I’d pull the BLT on that road. It’d be better to go the long way around. Wow those sculptures are amazing. Enjoyed seeing your pictures of them. Great price on the throw from the thrift store. I don’t understand these people that are in such a big hurry while driving their RV’s. Can’t just stop them on a dime. I was thinking the very same thing about that speeding RV. Plus the weight going downhill at that speed could cause a tip-over on a curve. I always prefer looking at nature rather than man-made things but the serendipity and weathered look of the sculptures are so “right up my alley.” I have got to get out there and see them for myself. Thank you for sharing. One scary driver can ruin an otherwise pleasant day! Hopefully he doesn’t learn a hard lesson about fast curves in an RV. My mom feels the same way you do about steep, narrow, curvy roads…you might want to avoid the Moki Dugway near Monument Valley! I’m fascinated by those sculptures…even visited his website, but your photos are much better. What fun to see smiling elephants in the desert! 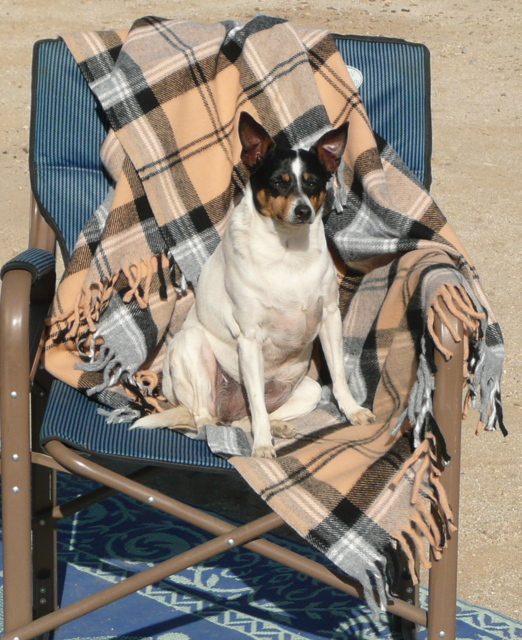 Almost as much fun as seeing a smiling Bridget on “her” new throw…Queen of the Camp Chair! I bet you see more of Lee…she sounds like she’s not quite as brave as you (yet) and might not have wanted to leave her Casita by itself. Send some of that sunshine north when you get a chance! I’m learning… If the map shows a road with a lot of squiggles in it, I think twice (and do some research) before trying it. Somehow I got on this road and couldn’t turn around! I’m using my new throw a lot already. Yesterday we sat outside after dark… Bridget on my lap with the throw wrapped around us both. (Spikey’s too tough for that.) Then I had it over my shoulders while reading in bed. This morning it held off the chill when sitting outside with coffee. Sorry, Kristine…I can’t send the sunshine northward… You have to come here! Yaqui = Yikes! Love it. I sing when I’m nervous behind the wheel too. Mainly going over bridges – for some reason in my 40’s long bridge crossings caused feelings of dread and anxiety. Being alone and singing at the top of one’s voice feels (and sounds) weird but is strangely calming. Your unfounded fear might be a left over from a previous life. Reincarnation may be a reality. After all remember the story of Bridy Murphy? Hi Kim! I sing nonsense lyrics that I make up as I go, like “Oh, here we go around the bend, up, up, up we go, we don’t look down, we look ahead, around and around we go, it won’t be long now!” or some such babble. It works! Just had a “head’s up” from daughter #2 who lives in the general area. As of tomorrow (Wednesday) a wind and rain storm coming. So hunker down! According to the reports, it will be over by Wed. night. We are on our way down from S.D. (establishing residency) and she was concerned about our travels….FWIW. I appreciate the warning, Nan. The forecast for Borrego Springs is possible thunderstorm from Wed. night through Thursday night. This morning we had grey clouds. They moved on so now it’s blue sky feathered with white. I’m keeping an eye on things. I don’t want my antenna up in an electrical storm. Good heavens! I don’t blame your daughter for being concerned. Stay safe! Yaqui or Yoeme are Indigenous people whose ancestors originated in the valley of the Río Yaqui in the northern Mexican state of Sonora. Many Yaqui still live in their ancestral homeland. The Pascua Yaqui Tribe is based in Tucson, Arizona. Yaqui people live elsewhere in what is now the southwestern United States. About 15,000 Yaqui speakers live in Mexico and 1,000 in the United States, mostly Arizona. Been enjoying the Sculptures, very neat out in the desert like they are. Thanks for covering my silliness (yikes!) with some real information! I admit I’m ignorant of the many different peoples who once lived in North America. Right now I’m in kindergarten when it comes to knowing about the West. I’m still working on mountains, rivers, lakes, plants, animals, etc. Glad you’re enjoying the sculptures. The desert is the perfect setting for Breceda’s creations. Then went back to the creek. The only deer I’ve seen in the desert. Makes you wonder where that deer came from and where she went. I’m glad my blog brought that memory to your mind. You were almost there Sue but good try! Blair valley is way cool! Like I said, I needed to get back before I lost my nerve! Can’t wait to return to Anza Borrego in Jan. to start exploring and discovering the metal sculptures. They are amazing! Glad you made the drive back safely. There’s a tyrannasaus rex and pteryldactyls (sp?) for you to find, too. I didn’t photograph the sculpture in front of the Chamber of Commerce and the ones at the restaurant on the main street. You’ll have fun! love your pics…and because of your blog, have added Borrego Springs to my book of places I want to visit. nice throw, I run a thrift store for our Animal Shelter but never thought of an “early bird” sale…. Hi Val! The early bird sale does bring in the customers. Best wishes for your efforts supporting your animal shelter. Love hearing about your thrifty “finds”!! Today was a good day for grocery shopping…lots of bargains…even some free items….LOVE THAT!! We all have to shop as well as we can these days. Good for you on the grocery bargains, Elizabeth. Food is pricey here, of course, although the local grocery is well-stocked. A bag of dog food that usually costs around $15 elsewhere is $20 here. I’m not complaining though because I’m fortunate to be able to afford the prices, since I’m living rent-free. Nice deal on that beautiful throw! Love the colors, Bridget must like them too 🙂 The metal artwork is interesting. nice slideshow! You don’t ever want to go north out of AZ on that shortcut into Utah!! Drove semi up there, got to the narrow top, jerked on the emergency brake, and woke hubby up to get us back down. Just couldn’t take it. My stomach was starting to roll!! Another narrow pass was in CA taking a load of pipe across mtns (forget the rt now) to vineyards near the coast. Windy, clifty on one side, scraping the mountian with the other side. The hard part was another t/t coming toward us and not really enough room. Whew …. but we made it! How he scraped by I’ll never know. Yaqui Springs sounds interesting. I’m putting it on my list. Hi Sunny! Your experiences with the semi make my trip through Yaqui Pass seem like a walk in the park. I can’t imagine how these mountain roads are built on cliffs. It must be very dangerous. We give little thought or recognition to people who perform brave feats like road-building on mountainsides. I tip my hat! I feel the same way. Our time together was too brief. Maybe we will meet again. I have to exercise self-restraint in thrift stores due to lack of space. It is fun though to see what treasures can be found. My favorite is finding a high-end piece of clothing that’s never been worn, still has the tag, and costs a fraction of the original price. Wonder what real horses would think of the metal ones? I am living vicariously thru reading your blog. As a semi-retired school teacher, I work 2 days a week as a driver for a car rental business, am responsible for a parent with Alzheimers, and am a 2 time cancer survivor in the last 3 years, I must stay pretty close to home. Sigh. . . I used to camp in a tent when I was in my 20’s and enjoyed the adventures. Thanks for taking the time to post so often and about all your encounters along the way. I enjoy my time reading your blog very much and it truly takes me away to feel like I am where ever you and the crew are. If I am ever able to in the future, I would like to rent a camper and have some more adventures! You must be one courageous lady to survive both teaching and cancer (twice). Your life sounds like a struggle right now. When life moves you to the next chapter, I hope it includes some camping adventures for you to enjoy.. In the meantime, I am happy my blog provides some diversion. My adventures aren’t very exciting these days, as I’ve slowed down for the winter months. But I’ll keep writing as long as people keep reading! Thank you for sharing some of your life with us. The rug rarely gets wet. Seems like the crew and I are usually in sunny weather. However, the few times it’s gotten wet, it wasn’t slippery at all, I guess due to the weave. I’m very pleased with it. After a year it hasn’t shown signs of wear and it’s rarely on a smooth campground pad. Actually my post was meant as humor. Empty boots belong to the sites in old western graveyards! I can’t find 215 in my CA atlas. Where are you coming from? From what direction would you enter Borrego Springs? The 215 Interstate joins the 15 Interstate near Temecula, CA and goes North thru San Bernardino, CA before joining up with 15 Interstate again. However, I think you have provided more than enough descriptions of where the sculptures are and just a little Google Map work by Commentor Sue should get her there.